My friend shared this recipe with me, once I tasted it I knew it was a keeper. It is a large recipe. Great to bring to gatherings or potlucks. Stir in flour and baking powder and mix well. Put pie filling over the base and then with a spoon drop the other half of the batter over the filling. This dough is fairly thick so it doesn't really spread well over the top, if you drop it by spoonfuls you get a pretty effect with the cherry pie filling peeking through. Bake at 350º for 30 to 35 minutes. Top should be slightly golden in color. 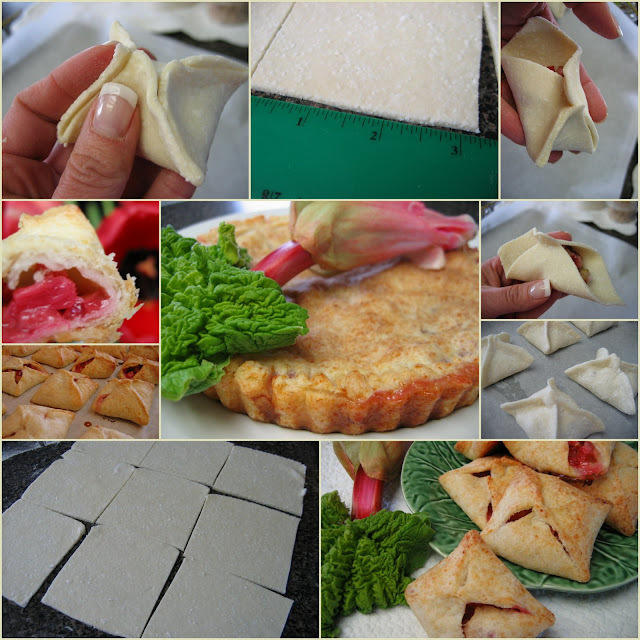 Dry Cottage Cheese makes a very light pastry which can be used for Perishky or tart shells. Combine the flour and the baking powder in your food processor or a large bowl. Add the dry cottage cheese and the finely cubed butter. Pulse in the food processor until finely crumbed .. .(when I looked at it I really didn't think it would stick together. . but I squeezed a tablespoon of crumbs and found that it held together well. If you are mixing without a food processor . . use a pastry blender or. . .I might even try the whisk on a kitchen machine. . .slowly. . don't make a mess. . . "
Dump it out onto the counter and squeeze into a flat rectangular disk wrap in cling film and refrigerate while you prepare your fruit. Mix together the rhubarb, sugar and tapioca. Once you have the dough chilled, Roll out a third at a time onto a floured counter top. Roll it as thin as for pie dough. Roll it into a rectangle approximately 10 X 13. Cut the edges to make it straight leaving you with a 9 X 12 inch rectangle. Cut into 3 inch squares. To make the perishky and put a heaping teaspoon of rhubarb onto the square and fold together the opposite corners and pinch together. Bring up one of the remaining corners and pinch and then the last one and seal with your fingertips. Arrange on a cookie sheet lined with parchment paper. You may also make a tart which I did with one of my third part portions of dough or you can simply roll the dough into a long rectangle, put it onto a cookie sheet lined with parchment paper, and put your filling onto the center, bringing up your sides and pinch them shut. Depending on how long it takes you to put together your pastries, here will be accumulated juice at the bottom of your rhubarb filling bowl so use a slotted spoon. Bake at 350F for about 20 minutes for the perishky and about 30 minutes for a small tart. The perishky will be nicely browned with they are baked through. I like trying different recipes for anything bread-like, since I have to have some kind of rolls in my freezer at all times. You never know when you may have to make a meal stretch or pack a quick sandwich. 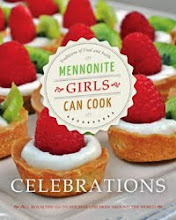 I found this recipe in the Mennonite Treasury a few years ago and was pleased with the results. It’s a basic bun recipe that calls for mashed potatoes. The rolls are extremely fluffy and soft, (no crusts here) making them a nice dinner roll - to sop up the gravy. Cook potatoes until soft. Mash along with about 1 cup of the water, so that you have 2 cups of mashed potatoes. Set aside. Scald milk, add sugar, shortening/butter and salt. In the meantime beat eggs in large mixer. When the shortening/butter has melted, make sure it is not piping hot and add the liquids slowly to the beaten eggs. Add mashed potatoes, 3 cups flour and then the yeast, mixing well. Transfer dough to large bowl, cover with a clean tea towel and plastic. Let rise 1 hour. 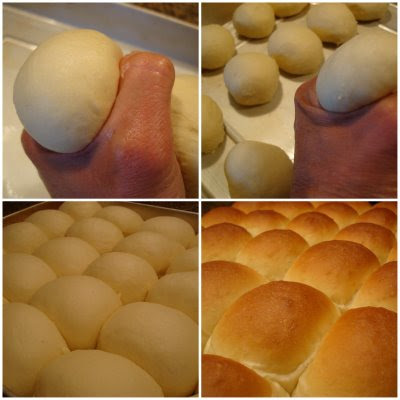 Shape into rolls, placing close together, but not touching, on greased pans. Cover the same way as before and rise again 1 hour. Bake at 375° F for about 20 min. *Tip: I don't know where the right place is to mention this, but I have noticed that flour is not the same in every country. It's something to do with the way its processed. This can especially affect yeast doughs. If you live in the US you may try adding 1 or 2 tablespoons vital wheat gluten to the flour to prevent them from going flat. 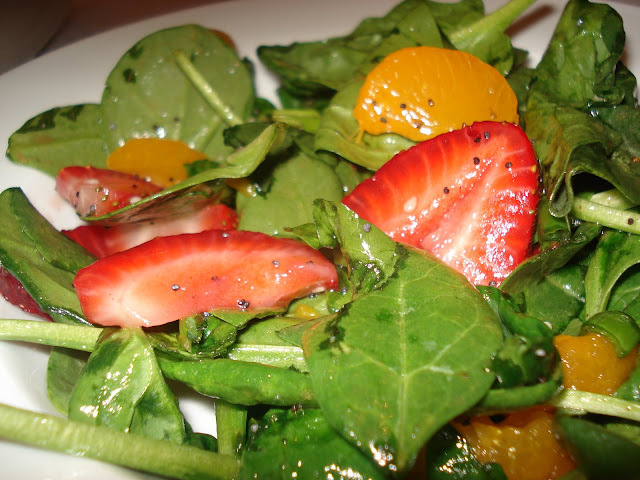 There are many wonderful recipes for a Spinach and Strawberry Salad, some with a Creamy Poppyseed Dressing or Oil and Vinegar Dressing. This recipe has a refreshing oil and vinegar dressing that our family loves. The dressing can last a couple of weeks in the refridgerator. Combine ingredients in a jar with a tight fitting lid. Shake very well, until sugar dissolves and is well combined. Dress immediatly before serving or the salad will get soggy. This roast's flavour comes from the delicious, full flavoured gravy. You could also make it in a slowcooker and have a great meal ready at the end of the day. In Dutch oven, on top of stove, brown meat slowly on both sides in hot oil. Remove from heat. Drain off fat and sprinkle roast with a little salt. Combine remaining ingredients and pour over roast. Return to heat. Cover tightly and simmer 1 3/4 -2 hours or until meat is tender. Transfer meat to serving platter, loosely cover with foil and let stand while you make the gravy. Skim off excess fat and heat pan juices to a slow simmer, scraping down all the brown bits with a spatula. Mix 1 tablespoon cornstarch with 1/4 cup water and 1 tablespoon brown sugar until blended. Pour slowly, a little at a time into pan juices stirring constantly, adding only as much as needed to make a nice smooth gravy. Bring to a slow boil. Remove from heat and serve with sliced roast and roasted vegetables. About 1/2 hour before the meat is done, turn oven on to 425 degrees F.
Cover a large baking pan with parchment paper, if desired. Pprepare potatoes, carrots and onions. Try to keep the pieces of somewhat uniform size. Mix remaining ingredients in a large bowl with the vegetables. Toss vegetables in oil mixture and lay out on prepared pan. Roast in prepared oven for 15- 20 minutes or until vegetables are browned and tender. 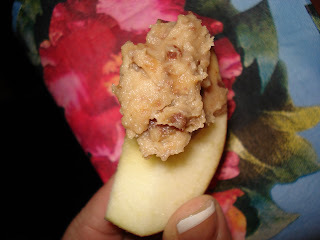 This recipe came from a community church cookbook from St. Catherines Mennonite Church and the recipe contributor was Betty P. I have changed things a wee bit with the sugared almonds and making the filling from a mix. 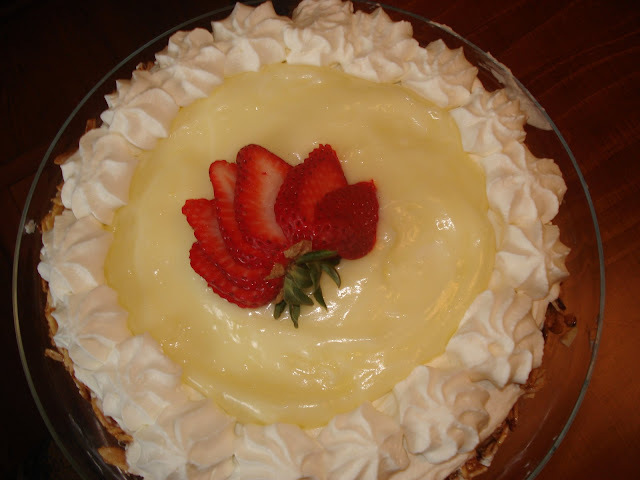 I will post the recipe with the Lemon Filling, but a Lemon Pie Filling mix works just fine too. Beat eggs till foamy, add sugar gradually, beat til thick and lemony. Fold in sifted dry ingredients. Add lemon juice. Gently stir in the milk and melted butter. Bake in two greased 8" pans at 375 for about 20 minutes or til golden brown. Leave in pan for five minutes and then cool on a cooling rack. Put lemon filling between layers and dust with icing sugar, or decorate it with whipped cream. In a double boiler, blend together corn starch and sugar, add boiling water, stirring all the time, until it is clear, about 10 minutes. Beat egg, lemon juice and rind. Stir into the cornstarch mixture. Cook 3 minutes. Beat in butter. Cool. Or just make your favorite Lemon Pie filling. 2 cups whip cream, whipped and sweetened to taste. I add a stabilizer for this cake called "Whip-It by Dr. Oetker. It just helps to keep the whipping cream firm for decorating. Two packages are enough for 2 cups of whipping cream. Take 1/2 cup of whipped cream and add it to the cooled Lemon filling. Decorate the cake with the remaining whipped cream and sprinkle with sugared almonds, around the edges. Cool and sprinkle around the cake. (this is not a high rising cake, so don't worry if the volume isn't what you are used too). 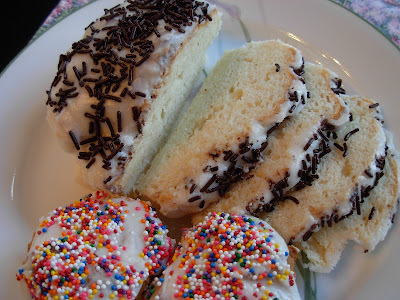 Pound Cake can be used in so many different desserts or enjoyed plain and simple with a cup of tea. The method I use is slightly different. It is simpler than the classic creaming of the butter and sugar. Sift the flour, salt and baking powder onto a piece of waxed paper or a large bowl. In a blender or preferably food processor. . combine the sugar and the eggs and vanilla. .process one minute. Slowly in a steady stream. .pour the melted cooled butter through the tube. Process until combined. Put the wet ingredients into a larger bowl. .and add the flour .. a third at a time. .blending t with a whisk. .. . until all the flour is combined. Prepare one 9 X 5 loaf pans or 3 small loaf pans. Spread the batter evenly in the pans. Turn oven to 325 F.
Bake the the larger pan for 45 minutes . . then check with a toothpick ..the toothpick should have a lingering crumb or two. If it isn't quite there. . check it again after five minutes. . The smaller loaf pans. . check after 30 minutes and then every five minutes after. If you bake them too long. .they will be dry. . Remove from pans to cooling rack while still warm. 1 pound . . 2 1/2 cups sliced or diced washed strawberries. .California strawberries won't really break down. . so consider how large you want them in the filling. Combine the cornstarch and sugar. Put the prepared strawberries in a medium saucepan. Add the cornstarch and sugar. Turn to medium high heat and stir constantly until hot and bubbly and thickened. . .about 3 - 4 minutes. Remove from heat. . pour into a large shallow bowl to cool completely before constructing your strawberry slice cake. Slice your cooled Loaf pan baked Pound cake into 4 layers. . .the top rounded edge is reserved for snacking or another use. You will use 3 flat layers for this cake. Whip 1 cups whipping cream combined with one package whipping cream stabilizer (the stabilizer is important since the cake will be refrigerated overnight) and 2 tablespoons sugar. Set aside. Line the loaf pan with plastic wrap with sides hanging over to remove the cake later. 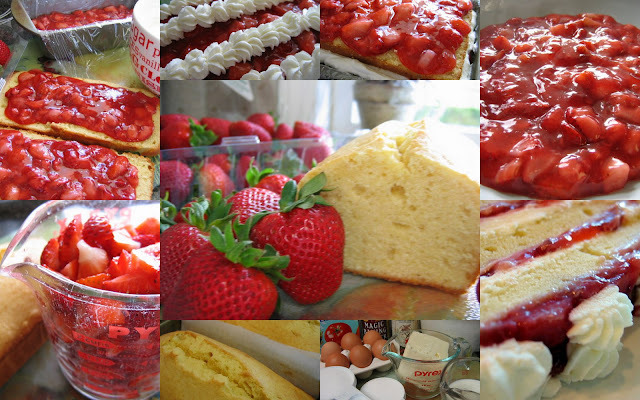 Divide the strawberry filling over each pound cake layer. Put the first layer in the loaf pan and put 1/3 of the whipped cream on top. Repeat. . but on the last layer. 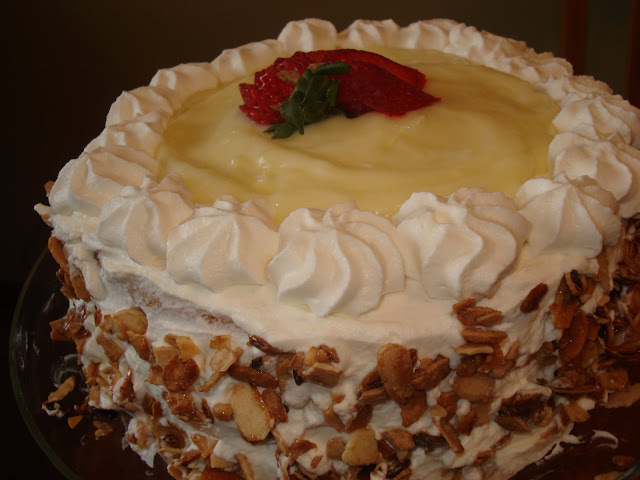 .put the remainder of the whipping cream in a decorator bag and use a star tip to decorate the top as you wish. Freeze until just firm. . .and then slice and refrigerate. Cutting while slightly frozen gives nice neat slices. This cake is a perfect make ahead cake Just freeze until the day you want to serve it, take it out in the morning, slice it and keep refrigerated until a half hour before serving. 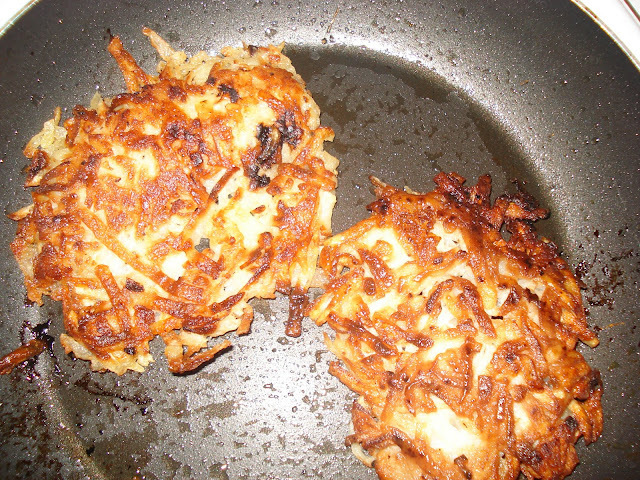 This is a dish you can make when you don't have any meat out for supper. Serve them with a salad or as a first course at a dinner party. I have doubled and tripled the recipe and it always turns out great. I clipped the recipe from a magazine years ago and have tweaked it a bit over the years. In a medium mixing bowl, combine egg, 4 tablespoons of bread crumbs, carrot celery, onion, mayonnaise, dry mustard, salt and hot pepper sauce. Gently stir in crabmeat just until combined. With wet hands, gently shape mixture into four ½ inch thick patties . Or you can make them smaller if serving as an appetizer. Mixture will be a bit crumbly. 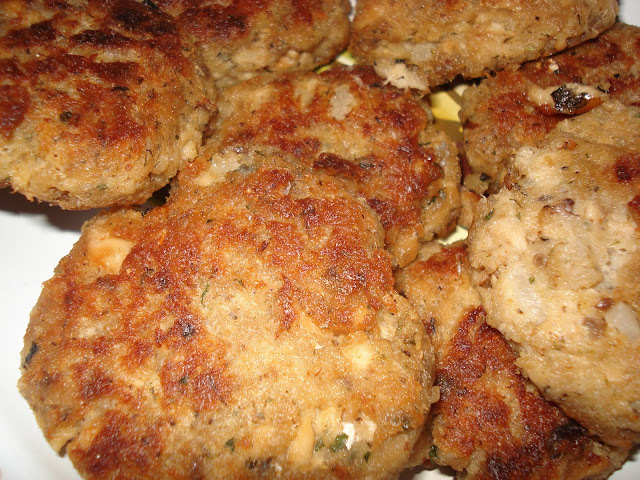 Pace remaining bread crumbs in a shallow bowl and gently coat both sides of each crab cake. Cook about 3 minutes on each side or until golden brown and heated through. Serve immediately with lemon wedges, if desired and Tartar Sauce. In a small bowl, stir all ingredients together. 'Beaver tails' originated in Ottawa..google it to get the story, they are simply pieces of bun or bread dough shaped some what to resemble beaver tails, then deep fried and shaken up in a mixture of white sugar and cinnamon. I have tried a 'beaver tail recipe' which I found online but I still like the ones best that are made from plain bun dough. Just take a piece of bun dough the size you like, put it on an oiled surface..I do this right on the counter top, press down and stretch it out with your fingers till you have a fairly flat shape of a beaver tail of course. You don't need to let it rise again but can let it rest for a few minutes if you wish. Deep fry and shake up in a bag with the sugar and cinnamon mixture. These are best fresh and hot! Be sure to leave some plain to have with syrup or honey. My Mom used to make these on bread or bun baking day for a treat, we called them 'lada koki' and later my family called them fry bread. We didn't put sugar/cinnamon on them but rather ate them with Roger's Golden syrup. In those days we didn't know that they would one day become popular as 'beaver tails'. Check this blog for bun recipes and when you next have bread or bun dough rising try them and tell us what you think! These buns are a quick and easy one-bowl prep. They taste great fresh or toasted the next day. In small mixing bowl, melt the butter in the milk in the microwave - cool to lukewarm. Divide batter into 6 muffin tins.... and bake in 375' oven for about 20 minutes or until the buns are golden brown. 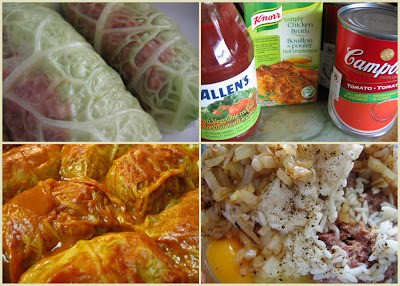 Cabbage roll recipes are a little like cake recipes. . everyone has a little different way of making them. . I wanted to share mine. . more for the handy hint about the cabbage. .but since I'm telling you that secret. .you may as well have the rest. Consider that you will take 2 days to make these. . .plan ahead for family gatherings. . .it is wonderful to pull them out of the refrigerator to warm up. In the bag that you brought your savoy cabbage home. . .place the cabbage in the freezer and leave for 12 hours or overnight.. . .remove and leave to thaw at room temperature. .this will take awhile. . so I often take it the night before the day I want to make the cabbage rolls. The leaves will be soft and easy to use without having to boil them. In a small saucepan or a microwave safe covered dish. . .cook the rice. . set aside to cool. The rice can be made the day ahead and kept chilled in the refrigerator overnight. Chop the onions fine and saute them slowly until they are golden brown. . .set aside to cool. In a large bowl, break apart the ground beef, add the salt, pepper, eggs, sauteed onions and the rice. . mix together until combined. . use your hands. Put about a 1/3 to 1/2 cup meat mixture at the bottom of the leaf and roll up. . the meat amount varies depending on the size of the leaf. . repeat until all the meat is used up. In a large mixing bowl. . .combine the tomato soup, juice, and broth. . pour evenly over the cabbage rolls. Cover with foil. . or the lid. Bake the cabbage rolls slowly at 325 for two hours. . serve or cool on the counter. .remove the foil (if you don't. . you will have little bits of foil on your cabbage rolls where ever it touches. .) cover with plastic wrap. .and either refrigerate or freeze. For reheating . .thaw first if frozen . .remove the plastic wrap and cover with a lid or foil. . and just reheat in the oven. . for about an hour .. at 325. . . or if you want, they can be reheated beautifully in the microwave on sensor reheat. For some, the idea of chocolate meringue may be new but I was introduced to it long before I had lemon meringue. This was a family favorite when I was growing up and my mom made it almost every Saturday in a large cookie sheet, so that there’d be enough for company the next day. I suggest using the homemade pudding recipe because it’s a milder version of the Jell-O packages and goes better (in my opinion) with the meringue. Combine flour and salt in medium sized mixing bowl. Cut shortening into flour with pastry blender until pieces are the size of large peas. Sprinkle with water and stir with fork, in circular motion, until mixture forms a ball - just barely holds together. Divide in half. Turn out on floured surface, pat and shape with hands into circular shape, then roll out to fit 9” pie plates. Prick crusts. Freeze one and bake one until just golden, about 12 – 15 minutes. In a small pot, heat 1 1/4 cup of the milk (med heat) and bring to boil. Set aside 1 cup. As you’re watching this, mix the cornstarch, chocolate and sugar in a small bowl. Add a little of the 1 cup milk, set aside, stir in the egg yolks and then the rest of the milk. With whisk, add this mixture to the milk just as it comes to a boil and stir until it thickens and begins to bubble. It may get lumps, but just keep stirring; it gets smooth after a minute. 5. Pour into baked pie shell. 6. Beat 3 egg whites with 4 Tbsp sugar, until shiny and thick. If you over beat it, it will be harder to get a nice finish. Spread over pudding. To get little peaks, touch the top with a spoon and lift. 7. Bake at 400° F for 7 min or until golden. Cool before serving. Keeps well in fridge for several days. A hint to remember - heat serrated knife well (under hot running water) before cutting up the pie. It keeps the meringue from sticking to the knife. Repeat between slicing. 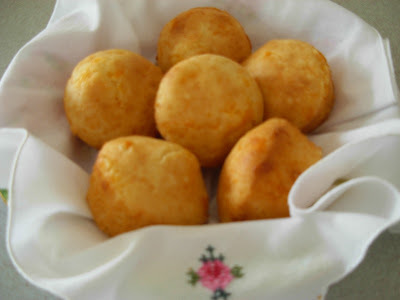 This recipe comes to me from my friend Bruni who have received many great recipe from. She serves them with a curry mango dip, but they are great on their own as well. You can add so many things to change up the flavors, like finely chopped red pepper, chopped parsley, thyme, etc. With your imagination it can keep the flavours interesting. Mix together well and form into little patties. Brown in a Teflon frying pan with about one tablespoon olive oil. About 3-4 minutes per side. If you make them burger size they make a good patty on a bun. A very nice change from a regular hamburger. My family really enjoys them. One of the most famous attractions of Texas is the Riverwalk in San Antonio. It's a great place to stroll or take a riverboat cruise...and there are restaurants galore to pick from. 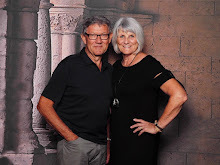 We just returned from a visit to Texas and a wonderful time on the Riverwalk. Memories of the guacamole will live on! We walked by a Bistro where they were making fresh guacamole at the table and before long we found ourselves sitting at one of their tables. Who can resist? We ordered a 'guacamole-for-two' salad, prepared right at the table. It was good to the last lick and I would have liked to order another...and another! But instead I had the server explain exactly what she was doing and have already enjoyed my copycat guacamole at home. 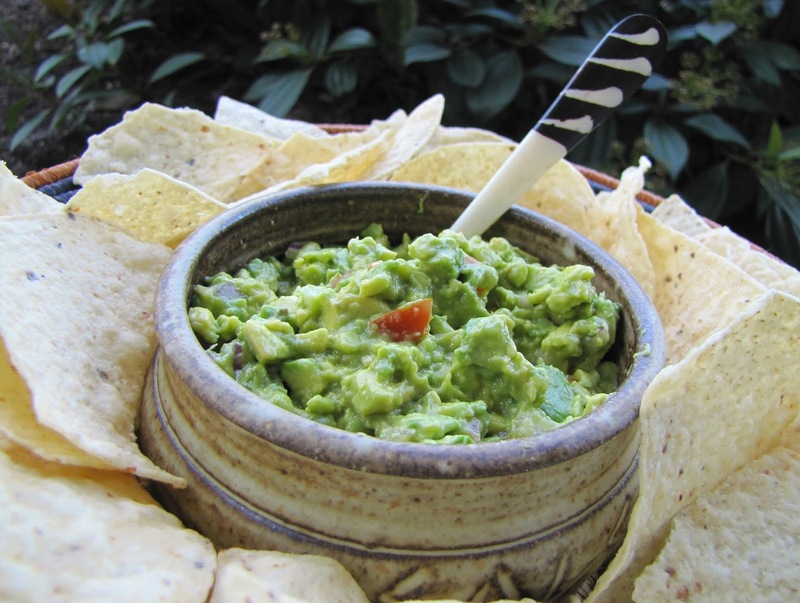 Add avocado and coarsely chop. Add onions, chopped tomato,and cilantro...fold into avocado mixture. Result should be crudely chopped not mashed. That’s it. I think the key is to getting avocado that is at it's peak; it should be a little dark-skinned and somewhat soft when squeezed. I posted a few photos of the 'real thing' over at My Front Porch today, if you want to take a peek. A cast iron bowl for presentation would be nice, but the taste is the same. Enjoy! We used to have a little neighbourhood restaurant that served very good Ukrainian food. My friend and I used to go there on occasion and she ALWAYS had Potato Pancakes. Sadly the restaurant has moved. It was her birthday and I invited her for breakfast. 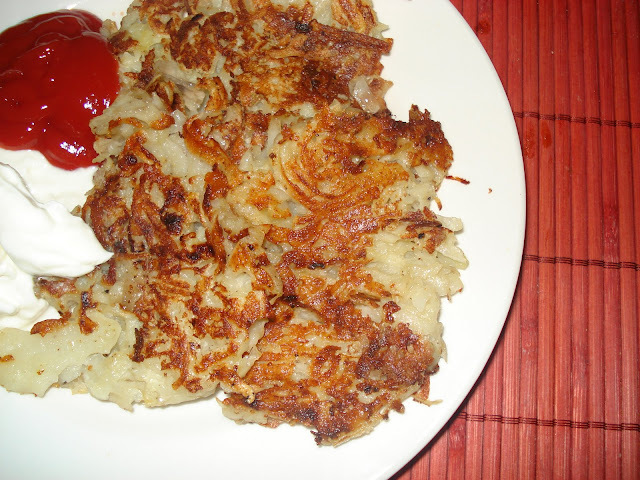 I offered to make her anything her heart desired, she ask for her favorite Potatoes Pancakes. I want to share the recipe with you. Put all the shredded potatoes in a cheese cloth or dish towel and squeeze as much liquid out of them as possible. Mix together with the remaining ingredients. Use a Teflon pan so that you don't need as much oil. Take about a 1/4 c. of the potato mixture and brown about 3-4 minutes on each side over medium heat. Serve with sour cream, ketchup or applesauce. Good on its on or as a side dish. You can see in the pan you really don't need much oil, just make sure your pan is hot enough. 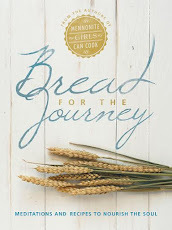 I found this recipe (submitted by Mary Braun) in the Mennonite Treasury, listed under Banana Cake, when I was still closer to being a newly wed. Over the years I have tried different recipes, all good, but somehow always come back to this very simple loaf, a favorite of one of my daughter’s. So I guess it deserves a spot on this blog. If you compare the recipes, you will notice that I have reduced the sugar and added orange juice, but it is great the original way too. Grease and flour 2 small loaf pans. Mash bananas and mix with orange concentrate. Set aside. Cream butter, adding sugar gradually. Add eggs, banana pulp and vanilla. Stir in combined dry ingredients, alternately with buttermilk. Pour into prepared pans and bake at 350° F about 40 min. or until toothpick comes out clean. The original suggestion is to serve it with whipped cream, but you don’t need a thing on it when it’s fresh. Freezes well. Our daughter made this wonderful meal for us and I had to have the recipe. The original recipe is from one of Jamie Oliver's cookbooks. He calls the recipe "My old man's superb chicken." I chuckled at the name, but thought I'd give it a new name for here at MGCC....although I do think that any man would really think this was superb! To begin, if your puff pastry is frozen, thaw according to directions on the box. In a non stick pan heat olive oil over medium heat. Saute chopped mushrooms and garlic for 5 minutes. Add the freshly chopped parsley, salt and pepper and continue to saute for about 8-10 minutes. Cool completely. Score Chicken breasts with a sharp knife making a pocket. Once the mushroom mixture has cooled, fill all 4 chicken breast pockets. 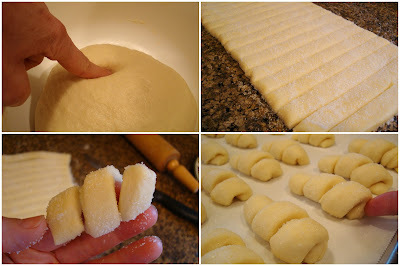 Using a little dusting of flour and a rolling pin, roll each puff pastry 'block' 18"x8" and 1/4" thick. Cut down the middle of each sheet, making a total of 4, 4"x18" strips. Place one stuffed breast at the bottom of one of the stripes of pastry. Starting at one corner roll so that the pastry overlaps, encasing the whole breast. Roll all breasts and place on a parchment lines baking sheet. Beat one egg and brush the outsides of each roll. Bake in 400 oven for 35-40 minutes. Pastry should be golden brown and flaky. While chicken is baking begin the mustard and wine sauce. You may want to double this it is so delicious. Combine both ingredients in a non stick sauce pan. Over medium heat allow the wine to reduce by about 1/4. Turn to simmer and add 1/2 cup cream. Allow to simmer for about 10-15 minutes. Season with salt and fresh pepper to taste. 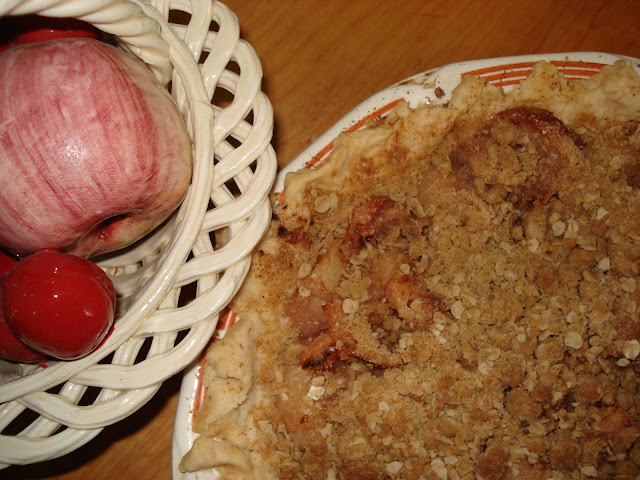 This recipe comes from our Douglas Church cookbook submitted by Marlene Epp. It is a delicious treat, especially slightly warm served with Vanilla Ice Cream. Line a 9 or 10" pie pan with you favorite pastry, plenty to choose from this site but this is my go to pastry recipe. I used what ever happens to be in the freezer that I have gotten from peoples trees like crab apples or others. When that is gone I use Granny Smith, or what ever happens to be on sale. You see this recipe is very flexible. Combine all ingredients and place into a pastry lined pie pan. Grate the cold butter into flour mixture to make coarse crumbs. Bake @ 375 for 50 minutes. 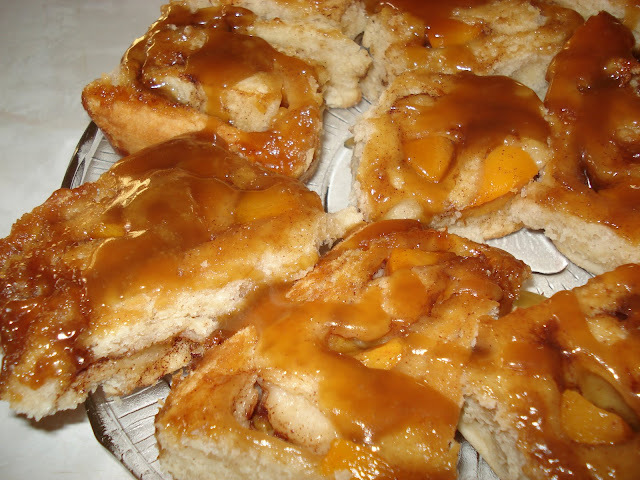 Discover a sweet caramel peach flavour in this moist, sticky pull-apart. All you need is a cup of tea or coffee, and someone special to share it with! I made this recipe for our bible study out of sheer frustration, because plan A of what I was planning on making flopped big time, so I went back to an old stand by. This is a tried and true recipe and every time I serve it I am asked for the recipe, so I thought I would share it will all of you. It comes from the Company's Coming cookbooks "Baking Simple to Sensational". Combine first 6 ingredients in large bowl. Cut in butter until mixture resembles coarse crumbs. Stir, adding enough milk until soft dough forms and hold together. Turn out onto lightly floured surface. Knead gently 4-5 times until dough comes together. Roll out on waxed paper on dampened work surface to about 8x15 rectangle. Combine brown sugar and cinnamon, sprinkle over dough leaving 1" edge at long side farthest from you. 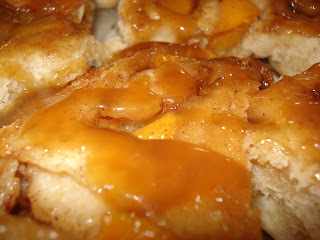 Scatter peaches over brown sugar mixture. Roll up, jelly roll style, from long side closest to you using waxed paper as guide. Press seam against roll to seal. Cut into 12 even slices used floured knife (use a serrated knife). Place in a 9" greased spring form pan, (I use a 9x13 pan). Bake at 375 for 25 -30 minutes. Let stand in pan for 5 minutes. Transfer onto serving plate. Keep warm. Be sure to put you pan into warm water immediately for easy clean up....you'll be sorry if you don't, the sugary syrup hardens and becomes like stuck on candy. Combine brown sugar, butter and whipping cream in small heavy sauce pan. Heat and stir on medium heat until brown sugar is dissolved. Boil gently for about 3 minutes, without stirring, until mixture is slightly thickened. Makes about 2/3 cups sauce. Sprinkle with toasted nuts if desired. I remember my Mom making these often. I loved them then and still do! I make these cakes when I have leftover cottage cheese when making perogies. 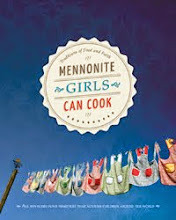 The recipe is in the Mennonite Treasury, must be the one my Mom used. They taste so good and bring back wonderful memories of when my Mom made them. Combine cottage cheese and eggs, mix well. Add flour and salt. Stir till well combined. Drop from spoon onto hot greased pan. Cook for approx 10 minutes, turn over after 5 minutes. I served them hot with applesauce and a green salad. Making French Toast is a simple way to add protein and calcium to bread .. and if you go easy on the syrup. .and use healthy bread. . .it could be considered a good breakfast choice. For the French Toast that I made while camping .. .I used cinnamon bread that we had picked up at a lovely little village bakery. This recipe can be easily doubled or tripled depending on how many are coming to sit at your breakfast table. In a medium sized flat bottomed bowl, whisk the egg and milk together. Add the dash of salt and combine. Heat a non stick fry pan to medium and melt a teaspoon of butter, spreading around the pan. Soak each slice of bread and lay into the fry pan .. turn once when bottom has browned. Keep french toast warm in the oven until ready to serve. If you are asked to bring a fruit platter to a function and the fruit is insanely expensive, this is a sweet solution and very good. It disappears very quickly. Dip the apples in lemon juice or pineapple juice to keep them from going brown, or just keep cutting as they get eaten. I usually count on at least 1/2 an apple per person, but often it works out to 1 apple per person. Combine the cream cheese, brown sugar and vanilla and beat until smooth. You can't be a Mennonite and not have Paska for Easter. Here is my gluten-free recipe that smells great baking and really tastes like the real thing.... My husband says so! I brought a loaf over to my daughter.. leaving it with my granddaughter at the door. My daughter called our cell in a panic a few minutes later... "Are you sure its gluten-free?? It doesn't taste gluten-free!" I love it when people can't tell !! Proof the yeast in lukewarm milk and sugar until doubled in size. When yeast is proofed, add to other liquids. Add the dry ingredients to liquids and beat on high for about a minute. Spoon into desired greased baking pans --- a mid sized loaf pan, muffin tins, or other desired shaped tins or pans. ** because gluten-free baking is soo much better fresh, I tend to bake smaller quantities .. I have not tried doubling this recipe but see no reason why it shouldn't work. This is an old recipe that got circled around the Mennonites a generation ago and I’m not sure who still makes it. My mom made about 6 recipes to add to other goodies at our (large) wedding reception and so they still have a special memory attached to them for me. The only sugar in this light, flaky little twist is the sugar that you roll them in. You can make them in a vanilla or cinnamon flavor. The aroma that wafts out of the oven when you bake them is reason enough to try them! Line 3 large cookie sheets with parchment paper. Melt and cool (so it’s not still hot) 1 cup butter. Beat eggs well in large mixing bowl. Add whipping cream, salt, water, 2 cups flour mixed with yeast, and butter, stirring each in well. Add the rest of the flour until it is well kneaded. (forms a ball around hook of kneading machine attachment, if using machine) It makes a nice smooth dough that is not sticky at all. Cover and refrigerate 6 hours, or overnight. Divide dough into 3 parts. Take one part at a time and shape into a log roll. Then, using sugar/vanilla mix or sugar/cinnamon mix for rolling out, roll into a 6 x 18 inch strip. Keep sprinkling sugar under and on top of dough as you roll. Cut into 1/2 inch strips. To form “ringlets” (icicles) twirl each strip around the upper part of your right index finger, slip off and push into a tight ringlet as you place them on cookie sheets. Bake at 350° F about 20 minutes. If you don’t use parchment paper, sprinkle flour on your sheets - but it is important that you loosen or remove icicles with lifter as soon as you’ve taken them out of the oven, or the sugar hardens, making it difficult to remove them later. This is a large recipe. It sounds like a lot of work, but mixing is quick and then you refrigerate it for night. In the morning it only takes about one hour to twirl and bake them and you don’t need to ice or glaze anything – they are ready to go. You can freeze them in an ice cream pail, but when you thaw them you want to open the lid so they don’t get soft. I have made half the recipe and rolled out 2 - 12 inch strips. Great for when you’re hosting a large group or adding to cookie trays at Christmas. They disappear quickly. I've been making these cookies for the last 30 years. My mom in law always made these and so I've been eating them since we started dating. 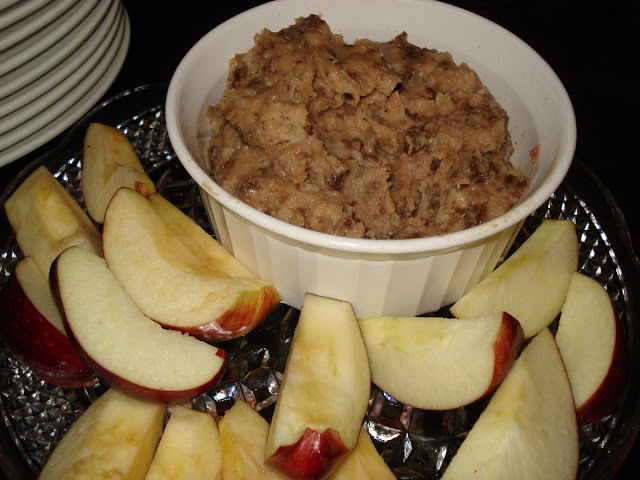 The recipe is from the Mennonite Treasury of Recipes and they are called Oatmeal crispies. 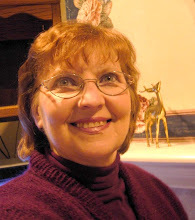 The original contributor was Bertha Thiessen. The cookies are crisp and freeze wonderfully. I made a half recipe .. for the two of us. These can be made with raisins instead of chocolate chips. . and the nuts can be eliminated as well .. .use your imagination with the add ins. .
Add the rest of the ingredients in order given. Bake at 350 F for about 12 minutes or until golden brown.